Dr. Aline LaPierre is the creator of NeuroAffective Touch® and director of The NeuroAffective Touch® Institute. 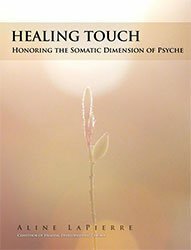 She teaches NeuroAffective Touch®, a body-focused and neurologically informed psychotherapy that uses somatic therapy and body-centered approaches as vital psychobiological interventions. Dr. Aline LaPierre is past faculty in the somatic doctoral program at Santa Barbara Graduate Institute (2000-2010), a clinician, author, artist, consultant, speaker, and teacher. She is currently Vice-President of the United Sates Association of Body Psychotherapy (USABP) and Deputy Editor of the International Body Psychotherapy Journal (IBPJ). 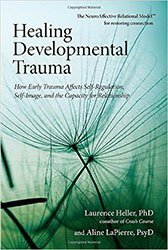 Aline LaPierre is the co-author of the bestselling Healing Developmental Trauma: How Trauma Affects Self-Regulation, Self-Image, and the Capacity for Relationship, a groundbreaking book in developmental psychology now available in ten languages. In the field of somatics, she has studied Somatic Experiencing® (SE™), Postural Integration, Cranio-Sacral Therapy (CST), Reichian Therapies, Bodynamics Analysis, Continuum, BodyMind Centering (BMC), and EMDR. In the field of psychotherapy, Dr. Aline LaPierre is a graduate of Pacifica Graduate Institute which intimately connected her with Jungian and Archetypal psychologies, and of The New Center for Psychoanalysis (NCP) focusing on the full range of psychoanalytic evolution from Object Relations to Relational and Inter-Subjective approaches. She was a member of the Allan Schore Affective Neuroscience study group for several years and maintains a private practice in Brentwood~West Los Angeles. Dr. Aline LaPierre is a Marriage and Family Therapist, California License 31838. Her current interests include developing NeuroAffective Touch® programs for couples and families.